CHENNAI: Veteran parliamentarian and a former head of the Public Accounts Committee (PAC), Era Sezhiyan on Saturday said Lok Pal Bill is still a distant dream and wondered whether the present generation will be able to see it passed. Speaking after honouring MPs at an annual awards event organised by Prime Point Foundation, Sezhiyan said there has been 12 avataars of the bill and it is yet to be seen whether the present generation will see a Lok Pal Bill which will satisfy not only the people but the requirements of this age. Ruing the absence of MPs during the Question Hour, he said that during his era (till 1984) hardly any MP missed the Question Hour but now things are different. 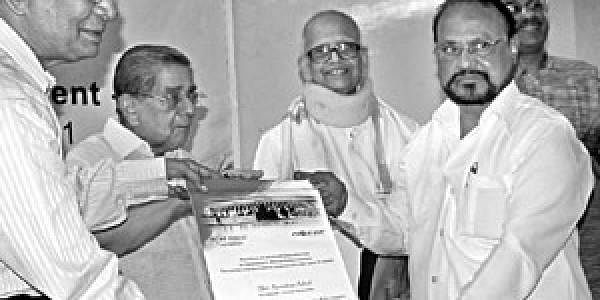 Former Central Vigilance Commissioner N Vittal highlighted how Anna Hazare’s crusade against corruption has united Indians.Earlier, Sezhian, Vittal, Gandhian and secretary of Thakkar Bapa Vidyalaya Samiti Sthanunathan honoured three top performers of 15th Lok Sabha. They include Congress MP from Tirunelveli S S Ramasubbu, BJP MP from Chandrapur in Maharashtra Hansraj Gangaram Ahir and Shiv Sena MP from Amravati in Maharashtra Anandrao Adsul. Ramasubbu, who is serving his first term as Lok Sabha member, was honoured for having an attendance of 97 per cent in the budget session and stands first among TN MPs. Maharashtra MP Ahir’s participation tally during the budget session include 70 debates, 17 private members bills and 499 questions, he tops in the total tally among the entire Lok Sabha and also for introduction of private members bills. While Adsul won the award for posing the highest number of queries (545 questions) in the Lok Sabha.